West Wind Productions shows off a preview of their upcoming Hammer Jaw walker for the Soviet forces in Secrets of the Third Reich. 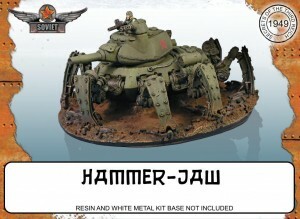 Here is a quick look at the Soviet Hammer-Jaw Spider Mech. This is designed for 1949 Secrets of the Third Reich and is a Resin and White metal kit . 28mm model due for release in September. More pictures on our Facebook page.